Place the rice in a saucepan of boiling water and simmer for 10-12 minutes, until almost cooked, but not soft. Drain well, rinse under cold water and drain again. Place the beaten eggs in a non-stick wok and cook over a gentle heat, stirring until softly scrambled. Place the cooked eggs in a bowl and set aside. Heat some vegetable oil in a wok until the wok gets really hot. Fry the bacon until cooked to your liking. Add the crushed garlic and vegetables. Sauté, stirring occasionally, for 1-2 minutes. Stir the rice into the wok, mixing to combine. Add the eggs, light soy sauce and a pinch of salt to the wok and stir to mix the egg in thoroughly. 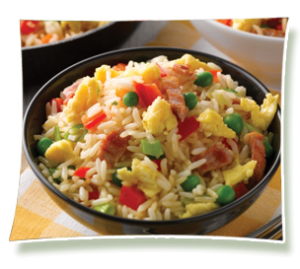 Transfer the egg fried rice to serving dishes and serve garnished with some shredded spring onion.